I shoot film. Not a lot, but it happens. When I shoot film it's usually with a wonky camera that does something cool that my digital camera can't do. Such as the awesome Lomography Spinner 360. Who could say no to a camera with a rip cord? So anyway, I shoot film. Then I take it to one of the three places in the world that will process it (no prints, and please don't cut the negative). And then it sits in a drawer. That's pretty much it. What I need, of course is a film scanner. I've never bought one because, damn. Another piece of crap that does one extremely limited thing that I hardly use, and which takes up space in my life. Of course I could have the photo lab scan the film, but they can't seem to manage unusual negatives such as those from the Spinner 360. So, yeah, into the drawer. Until the Lomography Smartphone Film Scanner came along. I originally funded the scanner on Kickstarter, but it can now be purchased directly from Lomography's site. The LSPFS is not really a scanner at all. Instead, it's a device that holds your smartphone, and some film, and points the one at the other. It backlights the film, and it is adjustable to hold most any smartphone. 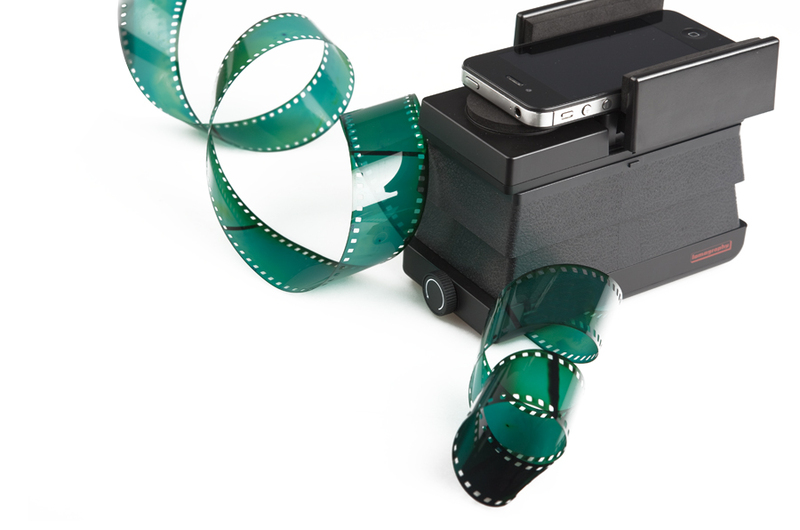 Once you've got your phone clamped in place and your film inserted, you simply snap a picture of the film with the phone's camera. Of course you can do that with any camera software on your phone, but the LomoScanner software provides built-in functionality to scan and automatically assemble motion pictures from your Lomokino, or panoramas from your Spinner 360. And of course it's got one-button sharing to the social photography network de jour. Did I almost forget to mention that the scan quality is crap? You're no fool, you probably figured that out already, though it may be even worse than you imagine. Don't think that you'll be getting scans at the camera's full resolution, because the film frame occupies only a small portion of the camera's field of view. For example, my iPhone 4S has an eight megapixel camera, but the scans I get with the LomoScanner are closer to two megapixels. That's hardly the only problem, of course, since the dynamic range of your phone's camera is tiny compared to that of film, and so on. Even so, this is still the world's greatest film scanner, for the following reasons: unlike any other film scanner, it is small enough, cheap enough, and easy enough that I actually bought it and use it. I don't have to buy a dedicated piece of delicate electronics that will eventually become obsolete, or break. The LSPFS doesn't seem likely to break, its electronics consist of a single lightbulb. An LED probably, but I haven't taken it apart to see. And while relying on a smartphone camera to scan your film might guarantee mediocre quality, the quality will improve every time you buy a new phone. (And hey, if you use your phone's built-in HDR mode, you can eke a bit more detail out of the scans.) The film is coming out of the drawer. And best of all, when I'm done scanning, the LomoScanner is so cute and tiny that it can go into the drawer.